Sprecher + Schuh’s KT7 series Motor Circuit Controllers provide convenient varieties of control schemes that reduce panel space and make up for easy installation. KT7 Series is designed to be used in a wide variety of different applications. The KTU7 Series of UL Molded Case Circuit Breakers are UL489 and CE listed for global applications. 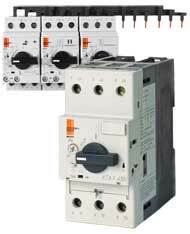 KTU7 is a current limiting circuit breaker that provides fixed short circuit and overcurrent protection. This component offers high interrupting ratings for 2- and 3-pole devices, from 0.5 to 20A and are rated up to 15A. The KT4 is a manual motor starter which features switching, thermal overload protection and control circuit signaling all in one compact unit. This component offers a high speed magnetic trip mechanism which limits the let-through current under short-circuit conditions. The KT4 can be supplied with field installable shunt trip or under voltage trip unit which exceeds the capabilities of the classic manual motor starter.